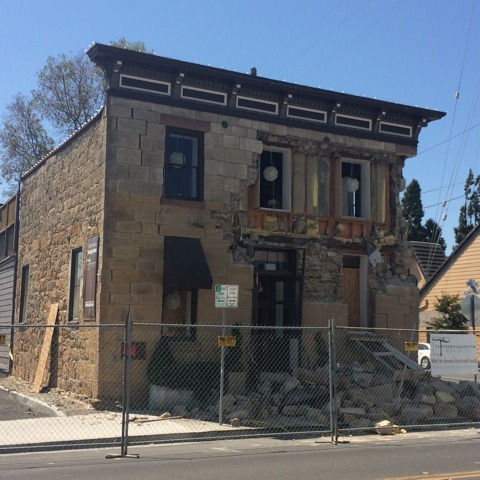 Napa Valley wines… and earthquake! Dwayne Perreault — Notwithstanding its influence on the world wine market, Napa Valley is quite small, stretching less than 50 kilometers from cooler Carneros in the south to the much warmer Castiloga in the north. Yet there is astonishing variety here: nearly 150 different soil types stretch along this corridor, which is never more than eight kilometers wide. I had a few appointments to meet some quality producers, where I was able to taste a wide variety of wines. 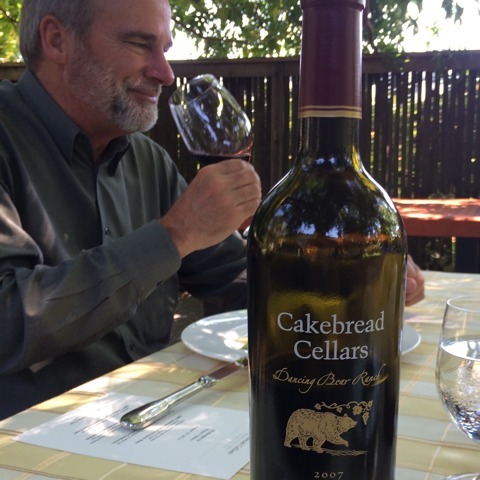 On August 18th, I had lunch with Bruce Cakebread, President of Cakebread Cellars. 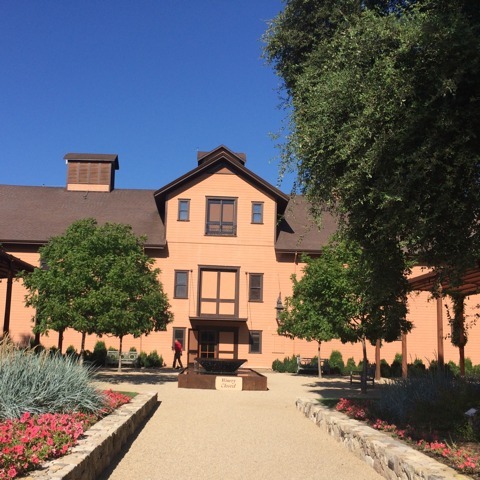 The business began in 1973, when brother Jack, owner of Cakebread’s Garage in Oakland, purchased a neighbouring ranch in Rutherford and planted vines. Bruce joined on as winemaker from 1979-2002, when he was promoted to President and now oversees all operations. The Cakebreads are known to be a culinary family; they regularly hold wine dinners in three different venues on their property. So we sat down in their Pecan Patio for a lovely four course lunch accompanied by seven different wines. First was the Napa Valley Sauvignon Blanc 2009, dry with very little fruit, nice mouth feel and medium high acidity. I was surprised that a five year old Sauvignon was holding so well, so we opened a 2013. It was fresher with more citrus notes, but less complex. The 2009 has actually aged better than many Sancerres, though whether Sancerre should be aged is another topic in itself. The Napa Valley Chardonnay 2009 is a lovely wine, with white fruits and a sultry pepper, opulent with a thick texture and oaky overtones which linger in the long aftertaste. It’s not Napa, but the Annahala Ranch Pinot Noir 2012 from the Anderson Valley had nicely balanced light red fruits, very Burgundy-like and accompanied our roasted Wild King salmon superbly. Bruce noticed my Burgundy reference and opened a bottle of the Two Creeks Pinot Noir 2012, also from Anderson Valley, to show the difference between the two. This was richer and darker with a bit more tannic grip; I think it would be perfect for game birds. Finally, the Howell Mountain Dancing Bear Ranch 2007. The flagship wine is predominantly Cabernet Sauvignon, with a bit of Merlot and Cabernet Franc. A very well structured wine, now in its prime, very dark and rich with strong but fully integrated tannins, extremely good. So convivial was our lunch with Bruce that we suddenly realized we were running late for our second visit, with Trefethen Vineyards. Bruce had his staff call his neighbour, just 10 kms or so away in Oak Knoll, to let him know we were on our way. Eugene Trefethen bought the abandoned Eshcol winery in 1968, and the family replanted the vineyards and refurbished the 19th century old wooden, gravity-flow winery, which reminded me a bit of Château Lynch-Bages. His son John produced Trefethen’s first commercial wine in 1973, and the Trefethen 1976 Chardonnay was named ‘Best Chardonnay in the World’ at the Gault Millau World Wine Olympics just six years later. We first tasted the Riesling 2013. Oak Knoll is cool enough to produce white wines of character, and this Riesling is dry, mineral and crisp with hints of lime. The Harmony Chardonnay 2012 is lighter and one would say fresher than Cakebread’s, less expressive perhaps but a fine culinary wine for fish dishes. As for the reds, the Cabernet Sauvignon Reserve 2007 has an extremely dark and rich attack with a leaner aftertaste. The tannins are not overly strong and tend to be noticed in the back of the mouth. The Dragon’s Tooth 2011 is an interesting wine, mostly Malbec with a bit of Petit Verdot and Cabernet Sauvignon. It’s very full and dark, somewhat tarter and greener than the Cabernet Sauvignon, though some bottle aging will no doubt smoothen the edges. We did not sample the flagship wine, the HaLo Cabernet Sauvignon, but the Late Harvest Riesling was a nice way to end our tasting. An unctuous wine with extreme fruit: lime, peach, pear and apricot. Back in San Francisco six days later, the earthquake hit. Since it happened at 3:20 a.m., I slept right through it. My girlfriend however woke up, and said not only was the bed shaking, she could hear the timbers of the house creaking as the foundation was rattled. I returned to Napa just two days later. It was astonishing to see the destruction. Entire facades had crumbled and huge cracks had rendered buildings unsafe. Over a million dollars worth of vintage bottles had fallen from the shelves of wine shops and libraries and broken, the wine simply circling down the drain. Many wineries had stacked full barrels collapse and fall upon each other. Unfortunately, several estates including Trefethen’s historic Eshcol winery, were structurally damaged. The price tag for all this destruction is over $400 million. My last visit was with a younger and smaller business. Keplinger Wines was set up in 2006 by husband and wife DJ Warner and Helen Keplinger. Helen had been making wines in Priorat the previous two years, and came to California looking for good Grenache. Rhône grape varieties are still not common in Napa, so they source their grapes from excellent high elevation sites in Amador County at the Sierra Foothills. I was very impressed with their Lithic 2012, a Grenache-Mourvèdre-Syrah blend. The wine is both rustic yet refined, with concentrated dark fruits and a silky aftertaste. Equally impressive was the Diamond Bar 2012, 100% Syrah from 25-30 year old vines. It’s the very first vintage and they only produced 90 cases. Hopefully there will be more, as it is a truly upright, powerful wine.